Renaming vSphere Host or a vSphere Cluster which is managed by vRA can cause different problems if not done properly. There are a couple of articles at the Additional Resources section of this article that describe how to do this properly for previous versions of vRA. 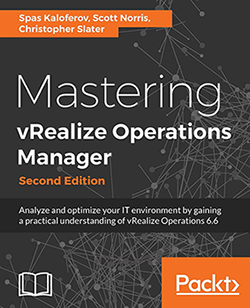 In this article we will demonstrate how to accomplish this for vRA 7.0. For the purpose of this article I have a 2 node vSphere Cluster called vCenterCluster which is managed by vRA. The two node names are: esx-pay-a-31 and esx-pay-a-33. Renaming a vRA managed vSphere host is pretty straightforward process. Move all VM’s to the remaining hosts that will not be renamed. 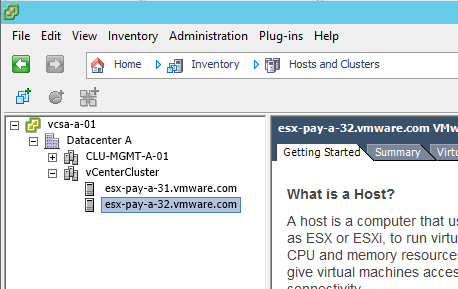 If the ESXi host is part of a cluster, first enter the Maintenance mode to remove it from the cluster. If the ESXi host is managed by VirtualCenter/vCenter Server, disconnect and remove the ESXi host from the vCenter Server. Run Data Collation on the Computer Resource and make sure it finishes successfully. 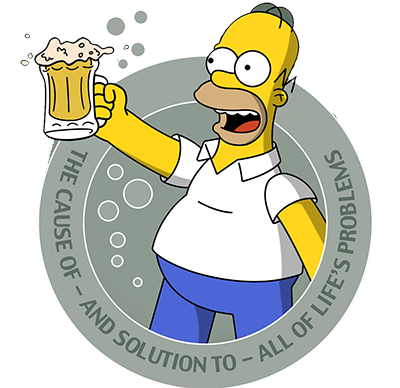 Join the ESX host to VirtualCenter/vCenter Server and clusters. 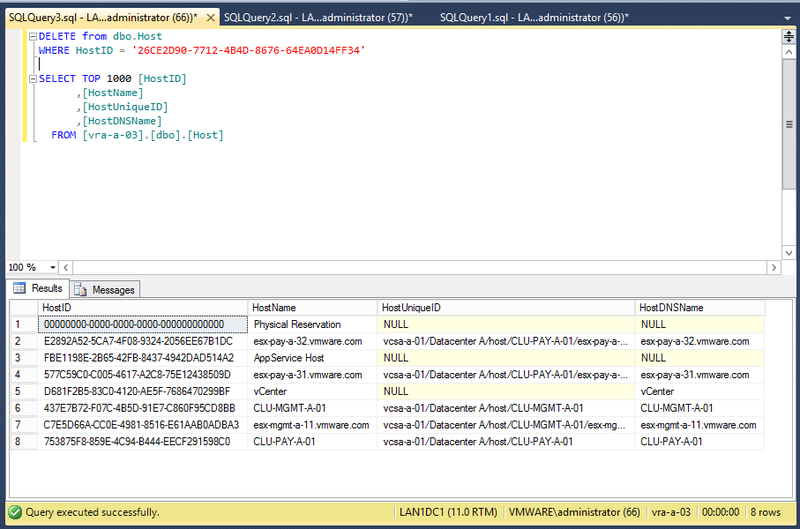 Using SQL Management Studio connect to the vRA database. 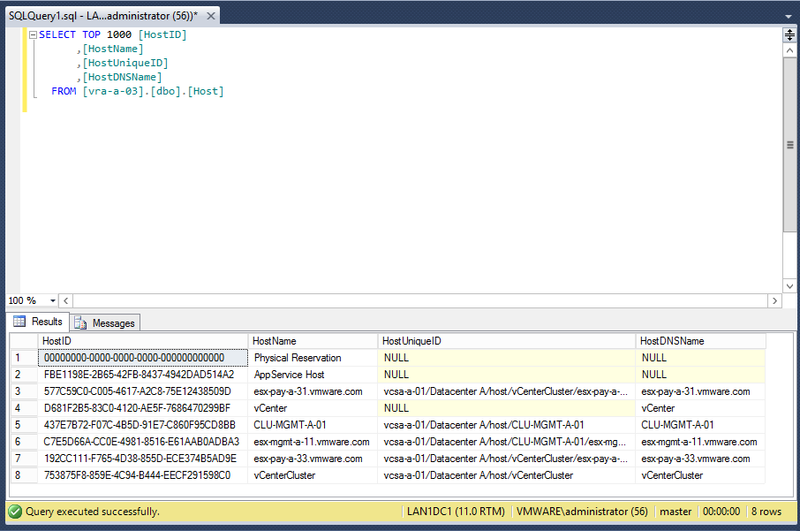 Update entries referring to the old vSphere Cluster name from the vRA database with the new vSphere Cluster name. 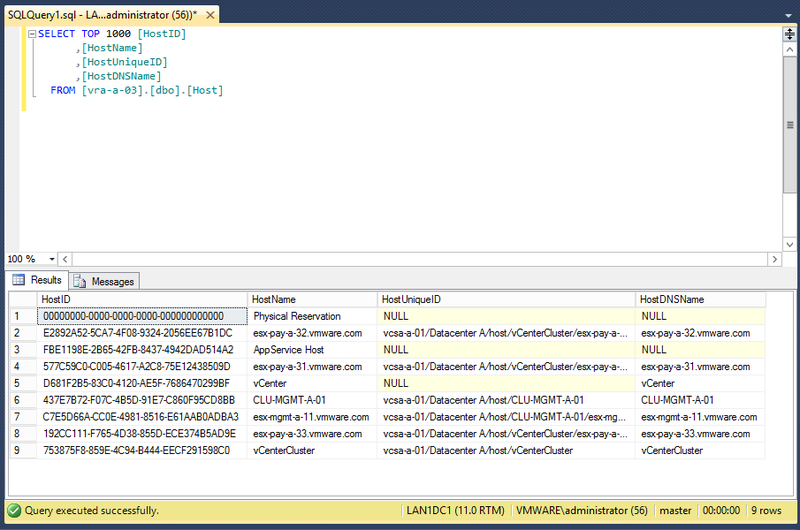 Remove ghost entries referring to the old vSphere Cluster name from the vRA database. Let see these steps with more details. 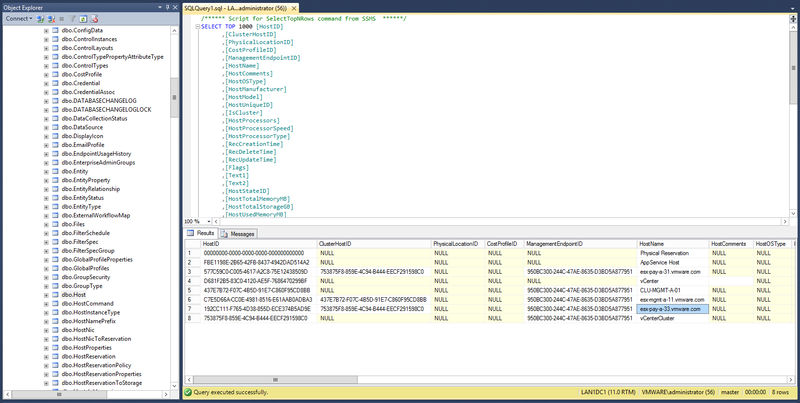 Navigate to SQL Management Studio and connect to the vRA SQL database. Select and view all entries from the dbo.Host table. Take a look at the results. Note all entries referring to the old vSphere Host name. In this case the old name is esx-pay-a-33. Connect to the host directly with a vSphere Client. Click ESXi host. In the DNS Configuration tab, edit the Name field. Change anything else that is necessary in your environment. Make sure to run Data Collation on the Computer Resource. At this point you should have renamed the node (to esx-pay-a-32) and add it back to the cluster. This is the entry for the renamed host. Now that the entry is gone let’s perform some testing. Run Data Collection for the Computer Resource. Power ON/OFF VM that was deployed on the renamed host before it was renamed. All tests were executed successfully. Renaming a vRA managed vSphere Cluster is a bit more complex task then renaming just a vSphere Host. Run Data Collection for all Computer Resources connected to vSphere Cluster that will be renamed. 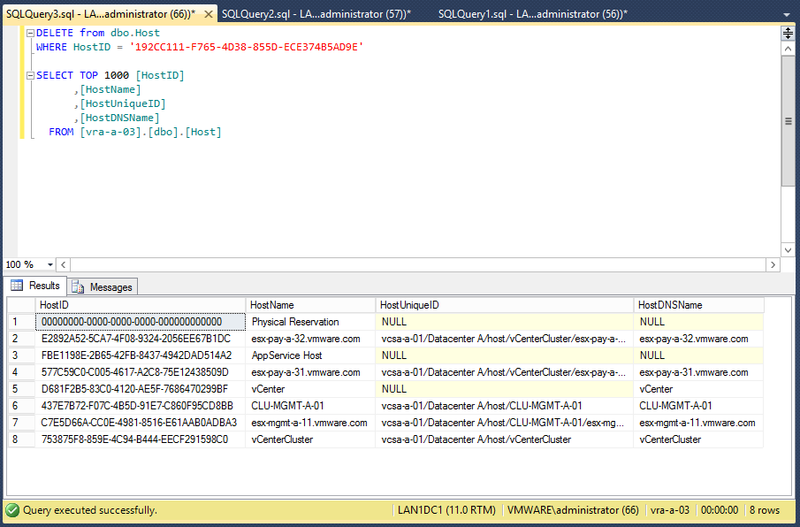 Toke backup of the vRA Database. Renamed the vSphere Cluster using the vSphere Web Client. Updated entries referring to the old vSphere Cluster name from the vRA database with the new vSphere Cluster name. 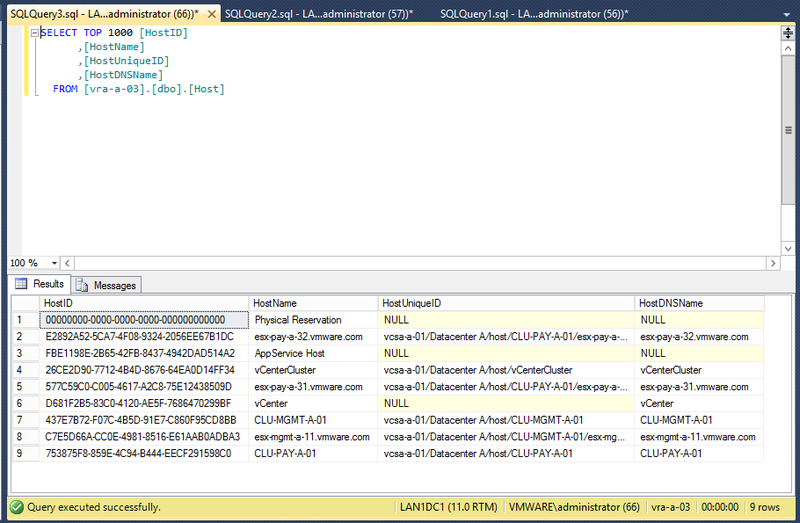 Removed ghost entries referring to the old vSphere Cluster name from the vRA database.. 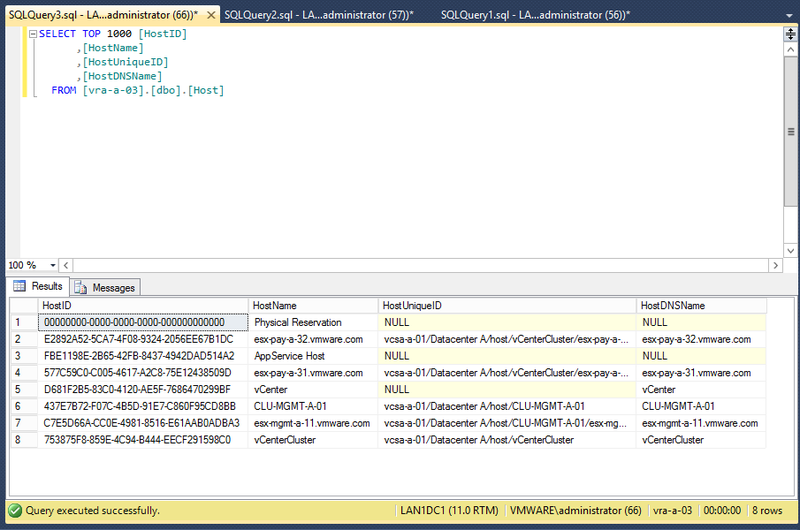 Removed entries for previous Data Collection executions from the vRA database. Take a look at the results. Note all entries referring to the old vSphere Cluster name. 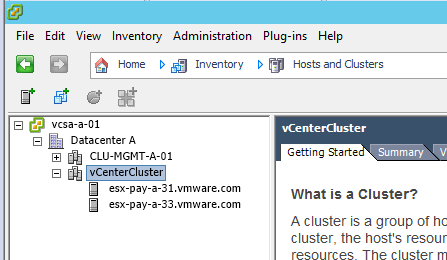 In this case the old name is vCenterCluster. Now we need to replace the old name in all the tables. 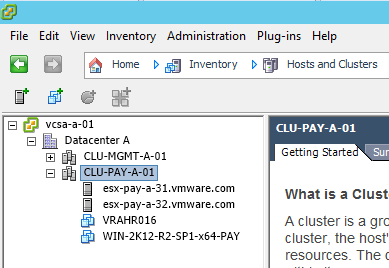 Login to vSphere and rename the cluster to CLU-PAY-A-01. 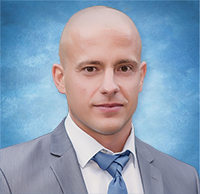 This entry was posted in Administration, Administration, vCenter, VMware, vRA, vSphere (ESX) and tagged cluster, host, managed, SKKB1026, vra rename cluster, vsphere. Bookmark the permalink.